iPhone Keeps Deleting Messages After Upgrade to iOS 11.3, How To Fix It? One of the common and baffling problems which too many of us face have to be the fact that iPhone now has the tendency of iPhone keeps deleting messages without asking. 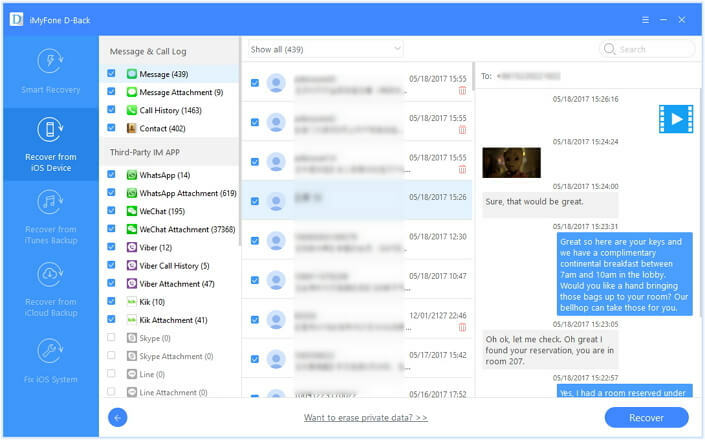 While there is a feature to help you delete messages automatically, but a lot of users have complained that despite not turning on the feature, they have witnessed the deletion. So, let us see the best possible fixes for it. You need to head to ‘Settings’ on your iPhone and then scroll down in the list to tap on ‘Messages’. 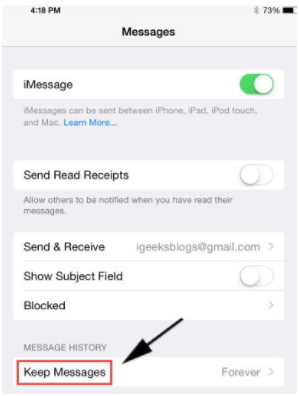 When there, go to the label ‘message history’ and now tap on ‘Keep messages’. Select ‘forever’ from the dropdown list and your messages won’t be auto deleted now. It is always advisable to have a backup. Here is how you can do it. Connect your iPhone to a Wi-Fi network followed by a connection to the power source. Now, you need to head to ‘Settings’ and then move to ‘iCloud’. Now, tap on ‘Backup’ and toggle the iCloud backup on. When you do that, you will receive a prompt that would say that your iPhone will no longer sync automatically to your computer. Click okay. Now, tap on back up now. This ensures the messages to be backed up and will be safe. You may need to restore your iPhone to ensure that this nagging trouble can be dealt away with. Here is how you can do it. Connect you iPhone to the system with the cable that it came originally with. Now launch iTunes and then select the device when it appears in the iTunes. Head to the summary panel and click on Restore. If you wonder how you can recover lost messages on your iPhone, even when you do not have a backup, one of the best software you can possibly use has to be iMyFone D-Back iPhone Data Recovery, which comes packed with the right kind of features. Here is a snapshot of what they are. It supports as many as 20 different types of data, including messages, contacts, photos, whatsAppdata, notes, etc. You can use the 4 different recovery modes to choose from, which greatly improves the successful recovery rate. 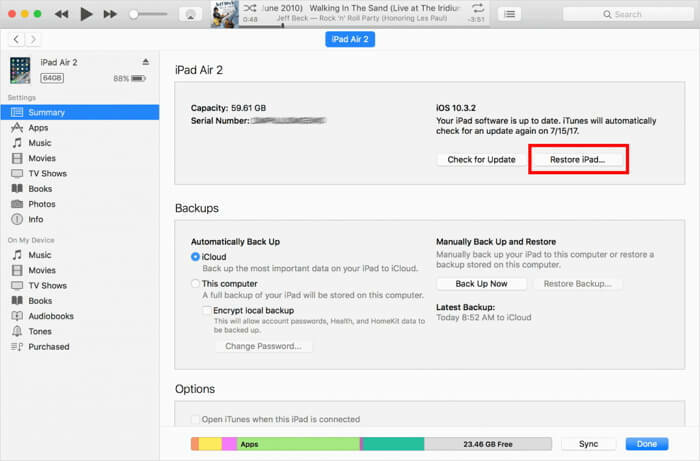 It helps to preview and extract data from iTunes and iCloud backup as well. It can fix different kinds of iOS problem without leading to any type of data loss. Now that you know the key features, you need to know the steps to recover data from the iOS device. Download iMyFone D-Back on the system and install it. When you launch the software, you need to then click on ‘Recover from iOS device’ tab. Now click on ‘Start’. You will now find a list of the different file types which you can recover. Choose the ones you want. The software will then prompt you to connect your iOS device to the same computer. Follow the onscreen instructions and do so. Now when the program has detected the device, you need to click on ‘Scan’ and the software will start looking for those file types. It will take some time and will display the list of content. You can preview the files and choose the ones you want to recover. Now click on ‘Recover’ and save them at the desired location. So, these are the steps which will help you recover even the deleted messages. As this software doesn’t leads to a loss of data, it is often preferred by users. Ideally check the above tips and see if the problem fixes before using the software and recovering the messages which seem to have been lost.